PS 191 is opening a G&T program for 3rd-graders in September. 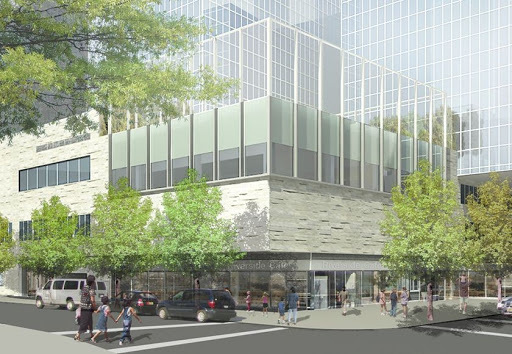 It will also move into a new building at Riverside Center shown here in an architect's rendering. Nearly 30 percent of the 35,000 children who took "gifted and talented" assessments in January scored high enough to qualify for one of the city's G&T programs. But, once again, the highest percentage of eligible students come from middle class districts in Queens, brownstone Brooklyn and Manhattan while residents of the city's poorer areas are largely shut out. Outreach efforts by the Department of Education in central Brooklyn and the Bronx did succeed in increasing the number of test-takers for kindergarten, but the number who qualified didn't budge: fewer than 10 four-year-olds scored high enough in District 16 in Bedford Stuyvesant, District 23 in East New York, District 7 in the South Bronx and District 12 in the central Bronx. Because of the small numbers, those districts will not have gifted kindergarten classes. However, in an effort to bring G&T to underserved areas, last year the DOE opened programs beginning in 3rd grade, rather than in kindergarten, in those four districts. (They also added a program in PS 191 in District 3 an attempt to attract more Upper West Side families to that school.) Admissions to these G&T programs is based on a child's grades and teacher recommendation, rather than a standardized test. This year, 1,882 2nd graders were deemed eligible in districts 3, 7, 12, 16 and 23. Their parents must apply by April 28. "Adding G&T classes at 3rd grade, based on grades and teacher recommendations is a step in the right direction," said schools consultant Robin Aronow of SchoolSearchNYC. However, she called the G&T kindergarten results in those districts "extremely disappointing" and said the DOE should consider alternative assessments or better access to test prep for children in those neighborhoods. More incoming kindergartners sat for the test this year: 16,582 up from 14,477 in 2016. Children who score at or above the 90th percentile are eligible for a district G&T program; those who score between the 97th and 99th percentile are, in theory, eligible for one of five citywide gifted schools. However, there are far more qualified students than seats: there are about 300 kindergarten seats in citywide programs. This year 797 four-year-olds scored a 99, fewer than the 923 who got a perfect score last year. Families whose children are eligible for a kindergarten program should fill out an application listing their choices by April 24 online or in person at a Family Welcome Center. They'll find out in June whether their child has been given a spot. The last day to register is June 16. Many schools will host open houses in April. See the DOE's calendar of open houses here. For those eligible for citywide G&T, PACE, the Parents Alliance for Citywide Education, is hosting a panel discussion, moderated by Aronow, on April 21 in Manhattan, where you can meet parents from the five schools. See the city’s summary of 2017 G&T results by district, grade and eligibility here. A chart showing a comparison of testers scoring 99 in 2016 and 2017 is here. A comparison of testers in 2016 and 2017 citywide by grade and eligibility is here.